Bertha C. Boschulte Middle's Ashukamay'ah Phillips shoots a 3-pointer during the fourth quarter of Monday's St. Thomas-St. John Interscholastic Athletic Association junior varsity girls basketball game at the Bertha C. Boschulte Middle School gymnasium on St. Thomas. Bertha C. Boschulte Middle School’s Ashukamay’ah Phillips, right, and Antilles School’s Madison Roy go after a loose ball during the second half of Monday’s St. Thomas-St. John Interscholastic Athletic Association junior varsity girls basketball game at Bertha C. Boschulte Middle School on St. Thomas. Antilles School's Madison Roy, left, tries to drive past Bertha C. Boschulte Middle's Qysha Benjamin, right, during the second half of Monday's St. Thomas-St. John Interscholastic Athletic Association junior varsity girls basketball game at the Bertha C. Boschulte Middle School gymnasium on St. Thomas. Antilles School's C'Orna Chhabria, left, goes up for a layup as Bertha C. Boschulte Middle's Shaquilla Lewis, right, tries to defend during the first half of Monday's St. Thomas-St. John Interscholastic Athletic Association junior varsity girls basketball game at the Bertha C. Boschulte Middle School gymnasium on St. Thomas. Antilles School's Madison Roy, center, and Bertha C. Boschulte Middle's Webena Danger, left, chase after a loose ball as Lady Blazers teammate Jada Isaac, right, follows behind during the first half of Monday's St. Thomas-St. John Interscholastic Athletic Association junior varsity girls basketball game at the Bertha C. Boschulte Middle School gymnasium on St. Thomas. Antilles School's Lynnel Warrell, right, and Bertha C. Boschulte Middle's Jada Isaac, left, vie for the jump ball at the start of Monday's St. Thomas-St. John Interscholastic Athletic Association junior varsity girls basketball game at the Bertha C. Boschulte Middle School gymnasium on St. Thomas. ST. THOMAS — Bertha C. Boschulte Middle School’s junior varsity girls basketball team overcame Antilles School’s second-half rally Monday for an 11-8 victory in the teams’ St. Thomas-St. John Interscholastic Athletic Association season opener. Down 6-2 at the half, the Lady Hurricanes (0-1) fought back to tie the score at 6-all at the end of the third quarter, and lead twice in the fourth quarter, the last at 8-7 on C’Orna Greene’s layup midway through the period. But Ashukamay’ah Phillips tied the score again at 8-all by hitting the front half of a two-shot free throw 30 seconds later. She missed the second shot, but the Lady Blazers (1-0) got the rebound, with Phillips nailing a 3-pointer to put Boschulte Middle ahead. Phillips scored a game-high nine points to lead the Lady Blazers, with Jada Isaac scoring the team’s only other points. Greene led Antilles School with seven points. Charity Sertich hit a free throw for the Lady Hurricanes’ other points. 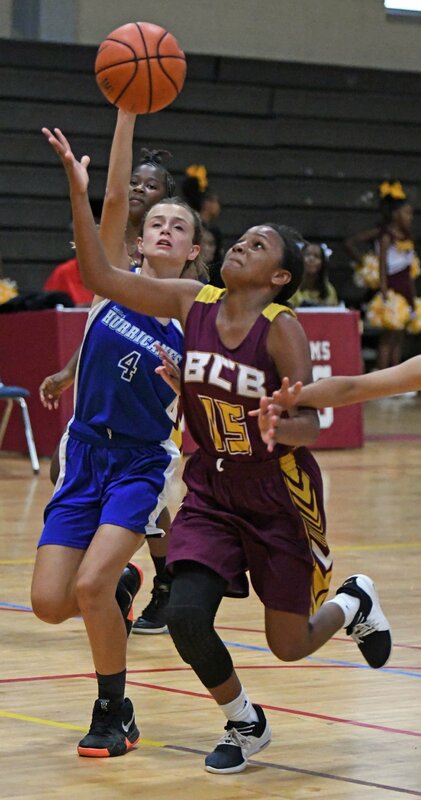 What’s next: League play for the junior varsity girls resumes Wednesday, with Charlotte Amalie High School taking on Calvary Christian Academy at the Bertha C. Boschulte Middle School gymnasium. 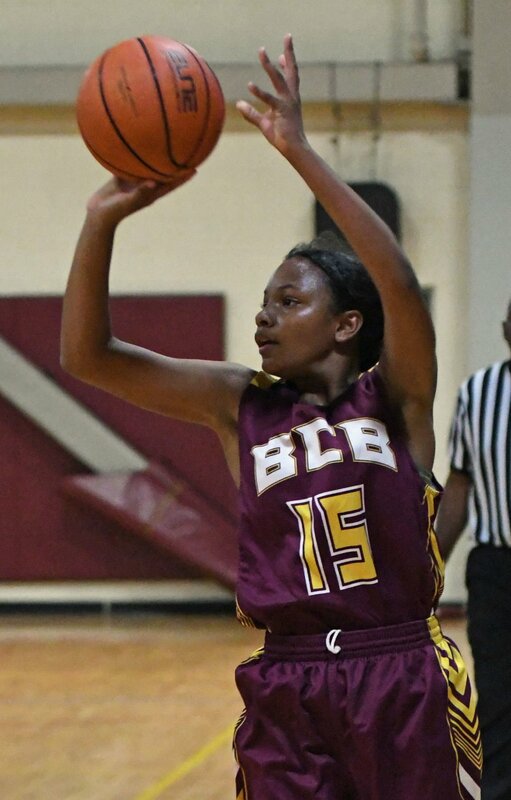 Game time is 4 p.m.
Boschulte Middle 70, Antilles School 23: The Blazers put together a big first half offensively and defensively in crushing the Hurricanes in the teams’ St. Thomas-St. John IAA league opener Monday. Boschulte Middle outscored Antilles School 38-4 over the first two quarters, including an opening 18-0 run in the first quarter. The Blazers (1-0) then put the win away with another near-shutout quarter, outscoring the Hurricanes 20-1 in the final period. Four players finished in double figures for Boschulte Middle, led by Nitsuh Williams with a game-high 16 points. Kevonte Charles added 14 points, Vern Frett had 13 points and Shaqel Richards 10 points for the Blazers. Antilles School hit just four field goals — three of those by Tristan Feddersen, who made two 3-pointers and finished with 13 points. The rest of the Hurricanes’ points came off free throws, but they only went 13 of 30 from the line. What’s next: The junior varsity boys league resumes play Wednesday, with Charlotte Amalie High taking on Calvary Christian at the Bertha C. Boschulte Middle School gymnasium. Game time is 5:15 p.m.
Alfredo Andrews Elementary School 36, Juanita Gardine Elementary School 15: K’mani George scored a game-high 16 points and Tajahre Jarvis added 13 points to lead Alfredo Andrews Elementary in its St. Croix Interscholastic Athletic Association league win. Jahkim Byron led Juanita Gardine Elementary with eight points. What’s next: The St. Croix IAA elementary boys league returns to action today, with two games scheduled. Pearle B. Larsen Elementary School takes on Ricardo Richards Elementary School at the Good Hope Country Day School gym, while Lew Muckle Elementary School faces Claude O. Markoe Elementary at the Juanita Gardine Elementary School gym. Game time for both is 4:45 p.m.
Juanita Gardine Elementary 14, Alfredo Andrews Elementary 6: Uniqua Williams scored a game-high 10 points to lead Juanita Gardine Elementary in its St. Croix IAA league win. Three players – J’Nira Osorio, Denirah Nurse and Chalyce Matthew – had two points each for Alfredo Andrews Elementary. What’s next: The St. Croix IAA elementary girls league returns to action today, with two games scheduled. Pearle B. Larsen Elementary takes on Ricardo Richards Elementary at the Good Hope Country Day School gym, while Lew Muckle Elementary faces Claude O. Markoe Elementary at the Juanita Gardine Elementary School gym. Game time for both is 3:45 p.m.